It’s not every day police receive a call like this. 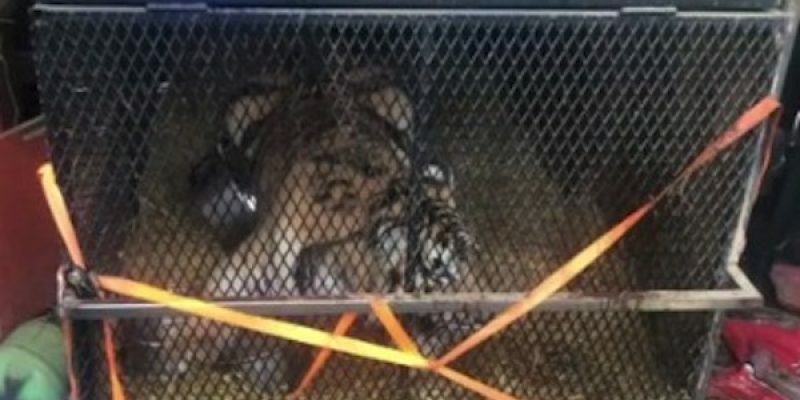 Yesterday they responded to a caller who reported finding a tiger being held in a non-secure cage in a dark garage of an abandoned house in southeast Houston. “Houston Police Department’s Major Offenders, Livestock Animal Cruelty Unit arrived on scene and found a 350-pound tiger inside,” ABC News reports. After obtaining a warrant, they found the female tiger in deplorable conditions. Next, they tranquilized the animal in order to be able to move it to BARC, the city’s bureau of animal recovery and control. BARC handles all kinds of cases of animal abuse, stray or rabid animals, or animal hoarding. BARC also runs the city’s largest animal adoption center for dogs and cats, and low cost veterinary services. The tiger will be transferred to another facility that is licensed to handle exotic pets,” Heidi Krahn, executive director of the Center for Animal Research & Education, told ABC News. “Finding a forever home for a tiger is not easy,” said Krahn, who is currently caring for six exotic animals at a cost of more than $1 million. The tiger is believed to have been smuggled through Mexico.